[150 Pages Report] The global botnet detection market size was USD 163.7 Million in 2017 and is projected to reach USD 1,191.1 Million by 2023, at a Compound Annual Growth Rate (CAGR) of 42.4% during the forecast period. The base year considered for the study is 2017, and the forecast period is from 2018 to 2023. The objective of the report is to define, describe, and forecast the botnet detection market by component (standalone solution and service), application area, deployment mode, organization size, industry vertical, and region. The report analyzes the opportunities in the market for stakeholders by identifying the high-growth segments of the market. It profiles the key players of the market of botnet detection and comprehensively analyzes their core competencies, such as new product launches; acquisitions; and partnerships, agreements, and collaborations. The report also covers detailed information regarding the major factors (drivers, restraints, opportunities, and challenges) influencing the growth of the market. The botnet detection market comprises major service providers, such as Akamai Technologies (US), Imperva (US), Distil Networks (US), PerimeterX (US), ShieldSquare (India), Unfraud (US), Instart Logic (US), Pixalate (US), AppsFlyer (US), Intechnica (UK), Zenedge (US), Reblaze (Israel), White Ops(US), Shape Security (US), Integral Ad Science (US), InfiSecure (India), DataDome (France), CriticalBlue (UK), Digital Hands (US), Variti (Switzerland), Stealth Security (US), Unbotify (Israel), Kasada (Australia), MfilterIt (India), and White Diagnostic (US). The stakeholders include Government agencies, Botnet detection management vendors, Independent software vendors, Consulting firms, System integrators, Value-added Resellers (VARs), Information Technology (IT) security agencies, and Managed Security Service Providers (MSSPs). Detailed analysis was performed to get detailed information regarding the competitors in the botnet detection market, on the basis of their solutions offerings and business strategies. The report reviews the major players offering data protection solutions and services. In addition, the report will outline the findings and analysis on how well each data protection solution provider performs within the MarketsandMarkets criteria. The botnet detection market is expected to grow from USD 203.2 Million in 2018 to USD 1,191.1 Million by 2023, at a Compound Annual Growth Rate (CAGR) of 42.4% during the forecast period. The major drivers of the market include an increasing need for security against bad bot traffic, growing number of smartphone users, and increasing adoption of APTs. Botnet detection is a standalone machine learning and fingerprinting technology-based security solution that detects and mitigates bad bots before harming websites, mobile apps, or APIs of an enterprise. The major forms of attacks that are carried out through bots include web scraping, application Denial of Service (DoS), skewed analytics, account takeover, form spam, gift card cracking, ad fraud, and payment fraud. The solution segment is expected to dominate the botnet detection market in terms of its contribution to the overall market shares. As the sophistication level of bot-attacks is increasing, organizations are deploying botnet detection solutions to mitigate against advanced persistent bots. The services segment is expected to grow at a higher CAGR during the forecast period. The botnet detection market by services has been segmented into professional and managed services. The professional services segment has been further segmented into training services, support services, and consulting services. The demand for services is directly related to the adoption level botnet detection solutions among organizations. The adoption of botnet detection solution is increasing to secure websites, mobile apps, and APIs. Cloud-based deployment mode is expected to grow at a higher CAGR than on-premises deployment mode during the forecast period. Cloud-based deployment benefits organizations with increased scalability, speed, 24/7 service, and improved IT security. The demand for cloud-based botnet detection solutions is rapidly increasing, as the central delivery model meets the IT security needs. As more applications are deployed over the cloud, there is a shift from traditional on-premises botnet detection solutions to cloud-based botnet detection solutions across large enterprises and SMEs. The botnet detection market by organization size is categorized into large enterprises and SMEs. Among these, the SMEs segment is expected to grow faster during the forecast period. With an increased adoption of BYOD and web and mobile-based applications for business operations, SMEs are deploying botnet detection solutions to prevent any form of bot attacks. Botnet detection solution and services have been adopted by various industry verticals, including retail and eCommerce, media and entertainment, travel and hospitality, BFSI, IT and telecom, government and defense, healthcare and life sciences, and others (education, auction sites, real estate, and energy and utilities). The media and entertainment industry vertical is expected to be fastest growing. This growth in the media and entertainment vertical can be attributed to the increasing bot attacks through ad frauds. 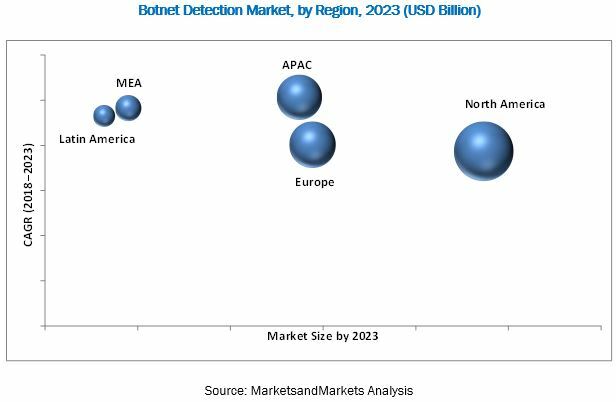 The global botnet detection market by region has been segmented into North America, Europe, Asia Pacific (APAC), Middle East and Africa (MEA), and Latin America to provide a region-specific analysis in the report. North America, followed by Europe, is estimated to be the largest revenue-generating region for the botnet detection management vendors in 2018. The US and Canada have a high focus on innovations obtained from Research and Development (R&D), and technologies. The APAC region is expected to be the fastest-growing region in the global market, due to increasing investments in botnet detection solutions to safeguard websites, APIs, and mobile apps from bot attacks. 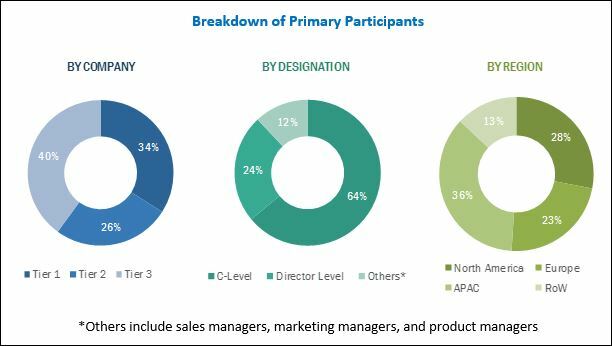 The major botnet detection market vendors include Akamai Technologies (US), Imperva (US), Distil Networks (US), PerimeterX (US), ShieldSquare (India), Unfraud (US), Instart Logic (US), Pixalate (US), AppsFlyer (US), Intechnica (UK), Zenedge (US), Reblaze (Israel), White Ops(US), Shape Security (US), Integral Ad Science (US), InfiSecure (India), DataDome (France), CriticalBlue (UK), Digital Hands (US), Variti (Switzerland), Stealth Security (US), Unbotify (Israel), Kasada (Australia), Mfilterit (India), and White Diagnostic (US). These players majorly adopted partnerships and new product launches as the key growth strategies to offer feature-rich products and services to their customers and further penetrate into uncatered regions. *Details on Business Overview, Products, Solutions and Services Offered, Recent Developments, and MnM View Might Not Be Captured in Case of Unlisted Companies.